Dozens of dogs have been parading their paws at a canine beauty pageant. 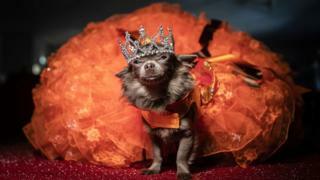 Pets of all shapes, sizes and breeds were dressed in various gowns and outfits to be crowned best king, queen, prince and princess at the "Furbabies" event in Wetherby. Dogs were put forward in 12 categories including best male and female pedigrees; best male and female puppies; and best rescue. Organisers said the pageant was held to raise money for a dogs rescue charity. Image caption This pooch wears a sash entitled "Miss Knine & Kitty Care"